According to legend, the Sidecar cocktail was created by a bartender at Harry's New York Bar in Paris during World War I, after the customer for whom it was invented rode up on a motorcycle. This cocktail was supposed to complement the bike. 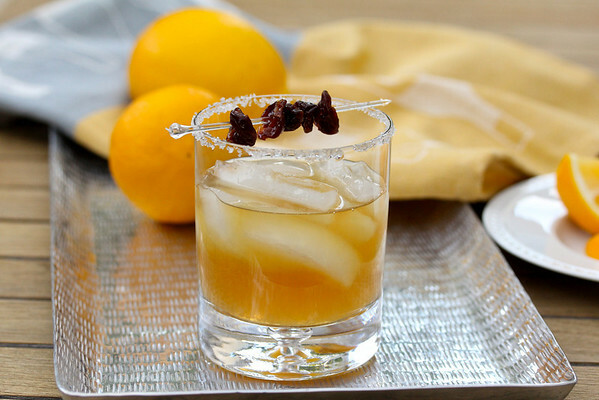 This cocktail is a mix of cognac, orange and cognac liqueur, and lemon juice topped with brandy soaked dried cherries. While using VS cognac is fine, I recommend using a quality orange liqueur instead of triple sec. I used sparkling sugar for the sugar rim, but regular granulated sugar is fine. 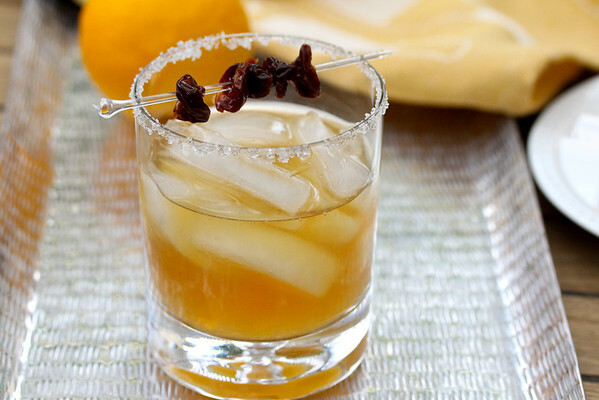 The dried cherries are soaked in brandy for about an hour prior to preparing the drink. The cocktail can be serve straight up or over ice. About an hour before making the cocktail, soak the dried cherries in the cognac. Rub a lemon wedge on the rim of a cocktail glass. Place sugar on a plate and twist the rim of the cocktail glass through it to coat with sugar. In an ice filled cocktail shaker, drain the cognac and skewer the cherries. Add the orange liqueur and lemon juice. Shake for at least half a minute and strain into the cocktail glasses (up or over ice). Top with the skewered cherries. So sophisticated! And delicious! I'm definitely pinning this for later! Great recipe! Thanks Betsy. I had always heard of it too and never tried it. It's delish! What a classy looking cocktail, fantastic!! 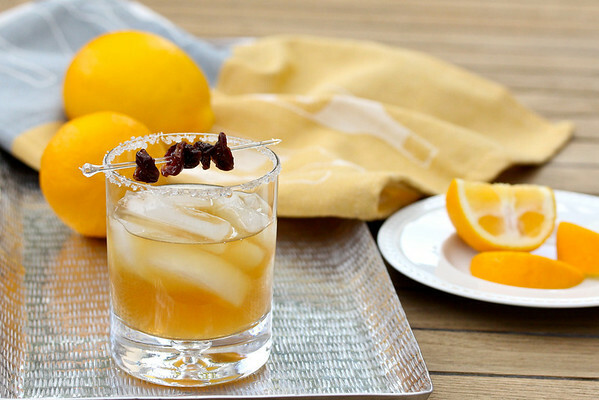 I've never had a sidecar but they sound delicious! Especially the cherries! I could eat them in bunches! What a fantastic combination of flavors in this cocktail, it looks delicious!! I've been wanting to try a Side Car at home, and think your version is the perfect one to start with! What a spectacular cocktail, Karen! I love the idea of soaked dried cherries.....mmmmmmmmm.... So glad your joined us for cocktail day! Thanks Liz for hosting this event! I love sidecars and you've made them even better! Love the soaked dried cherries! I just discovered them and wish I had found them before! 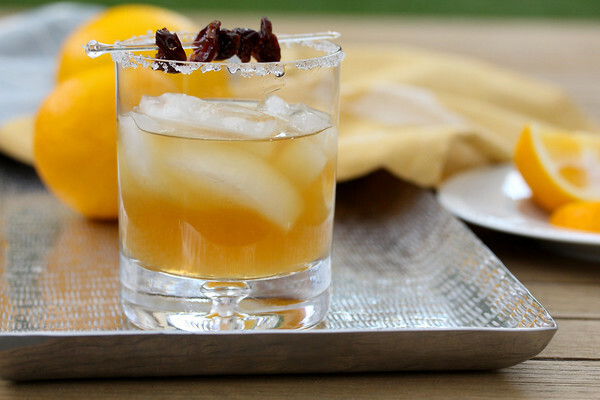 I never thought of using dried fruits as a garnish, but I really like it. Good idea! Thanks Donna! They add a nice flavor to the brandy. Adding a bit of cherry liqueur is nice too actually. Thanks so much for hosting Kim. Wonderful idea! Oh Karen! Side Cars are one of my favorite cocktails. Yours looks and sounds perfect! I totally agree with you on triple sec! Right? You need the good stuff! I've never had a Side Car before! We still have a bottle of cognac and I really want to give this a try. Not that I mind sipping it by itself (eek) but I love your side car recipe. I hadn't until recently. You definitely need to give one a try. Save the VSOP for sipping and get some VS for the side car.